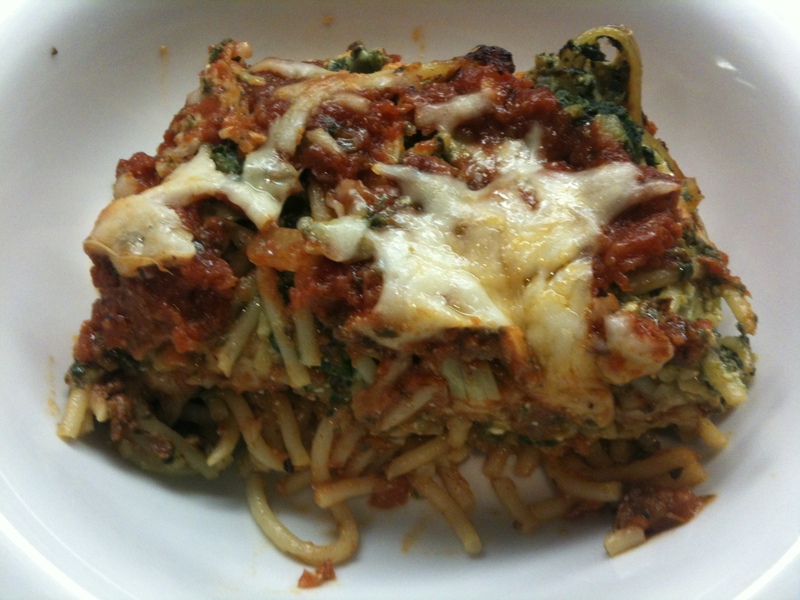 I made this last week with what I needed to use up in the fridge and it turned out to be a family hit. I had a ton of baby spinach to use up, 3/4 of a container of ricotta cheese, and everything I needed to make a good meat sauce. I made a pesto with the spinach and added the ricotta which made it nice and creamy. My boys are NOT spinach lovers but for some reason when I turn it into pesto they really love it. I made a simple meat sauce with a pound of organic grass-fed beef and a jarred tomato sauce then put it all together in a baking dish layered with cheese and finished it in the oven. I make a good and simple home-made meat sauce (or sugo as my Sicilian mother-in-law calls it) and I will post that next time I make it, but to keep this an easy week night meal I used a jarred sauce. I have tried several and have a couple of favorites. When it comes to buying a jarred tomato sauce, the best thing to look for is the fewer ingredients the better. 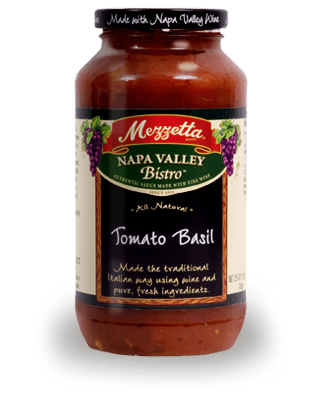 I like Mezzetta’s which is made with vine-ripened plum tomatoes, basil, garlic, onions, parsley, imported Italian olive oil and sea salt. That is about as close to my home-made sauce as I can get! I also love Rao’s marinara which takes it a step further with Imported Italian tomatoes, but it is a bit more pricey than the Mezzetta. This is one of those dishes that really can be put together with whatever you have or want to use. 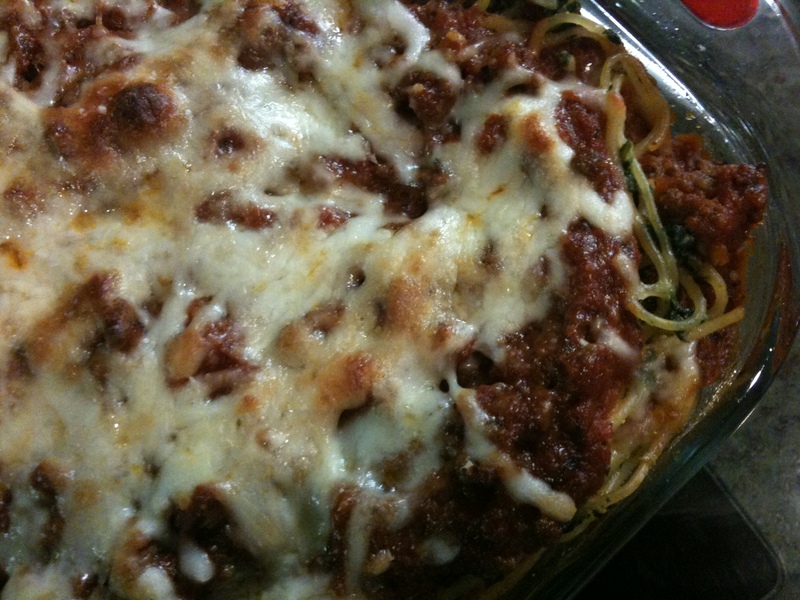 You can use a traditional basil pesto, you could add any veggies you want (some roasted zucchini or asparagus cut into bite-size pieces would be yummy), you could make a meat sauce with ground turkey or just keep it a vegetarian tomato sauce. This made dinner for the four of us with enough left-overs for another full dinner. My non-spinach loving kids loved this and didn’t even notice that it was a spinach pesto. Pre-heat the oven to 350 degrees. Cook the spaghetti in a big pot of WELL SALTED boiling water for about half of the suggested cooking time (it will finish in the oven). While you wait for your pasta water to boil, brown the ground beef or turkey until it is cooked through. Add the 2 jars of sauce and simmer for about 20 min. Spray a large rectangular baking dish with non-stick spray. When the pasta is done, drain well and return it to the pot. Add the pesto and ricotta to the pasta and mix well. Add some of the meat sauce to the bottom of the baking dish so that you have a thin base layer of sauce. 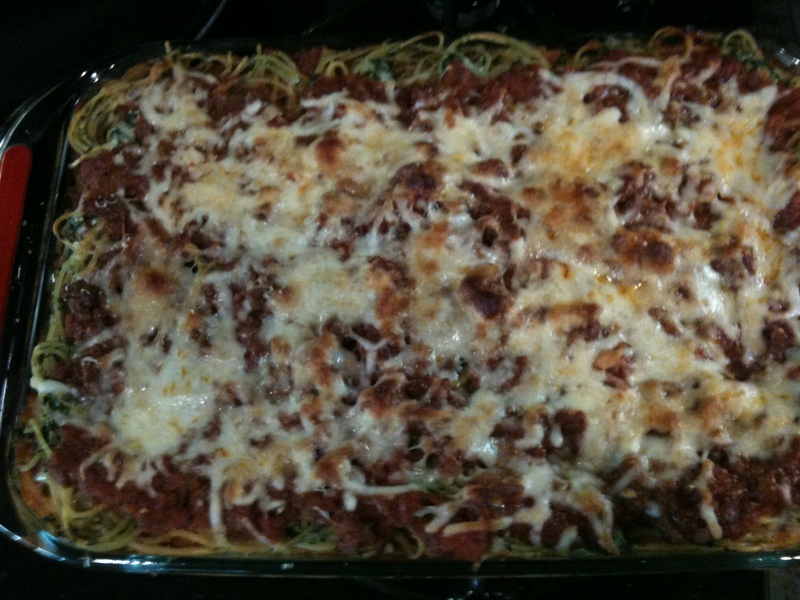 Next layer half of the spaghetti on top of the sauce. Add another layer of sauce on top of the spaghetti and top with a layer of shredded mozzarella. Finish with the remaining spaghetti, the rest of the sauce, and the rest of the mozzarella. Top with some fresh grated parmesan and bake for 30 minutes. The top should be bubbly and lightly browned in spots. Let the casserole cool for a good 10 minutes and serve. Combine all of the following ingredients except the olive oil in the bowl of a large food processor. Pulse until the spinach is chopped very fine and all of the ingredients are combined. Add the olive oil slowly while the food processor is running. Scrape the sides to make sure everything is mixed well.